It makes sense that mainstream flip phones, at least in the United States, have gone the way of the dodo. Smartphones have become incredibly cheap over the past few years, and usually offer more functionality than a comparable flip/candy bar phone. Samsung still releases them in its home base of South Korea, but they usually run Android. Today, Samsung officially announced the Galaxy Folder 2, which unsurprisingly will only be sold in S. Korea (at least for now). The phone has a 3.8" TFT LCD display, a Snapdragon 425 processor, 2GB of RAM, and 16GB of expandable storage. The battery is pretty small, at only 1,950mAh, but I suspect the display and mid-range CPU won't be very power-hungry. The phone runs Android 6.0.1 Marshmallow out of the box, and will cost 297,000 won (about $260). 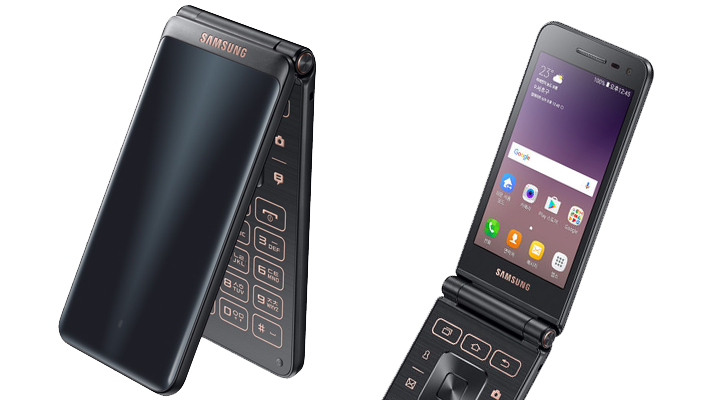 Regardless of how impracticable this phone might be, especially when trying to navigate through Android apps with a keypad (though you can give up and use the touchscreen), I really want one.